Birds were not invented at the pet store. 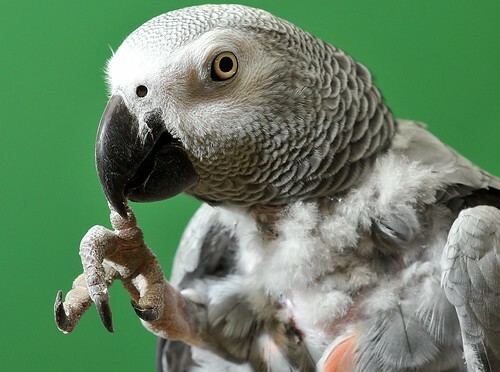 So to successfully care for a parrot, one must understand the bird’s biological needs, and strive to meet these needs above others when looking for guidance on bird care. Understanding a parrot’s biology is essential since they have evolved from a unique array of habitats such as a variety of altitudes, temperatures etc. Birds are very adaptive. For example, many parrots are subtropical – living 30 degrees north or south of the equator. For those species, they do not have 12 hours of light and 12 hours of dark. Parakeets and cockatiels are good examples; they live further from the equator and are photoperiod responsive because of this. Their biological processes are triggered by the length of time these birds are exposed to sunlight. An increase in day length (light) signals abundance to these birds, and the time for mating. Water can also bring on mating behaviors, especially for birds from drought areas like cockatiels. A study by E.D. Jarvis proves that animals respond to certain environmental triggers by producing proteins in their brains. These proteins then trigger certain types of behavior associated with breeding (a male canary singing, for example). This is also called Behaviorally Driven Gene Expression. So a change in light, food availability, height of a potential nest, or width of a hole can all trigger breeding for wild parrots. 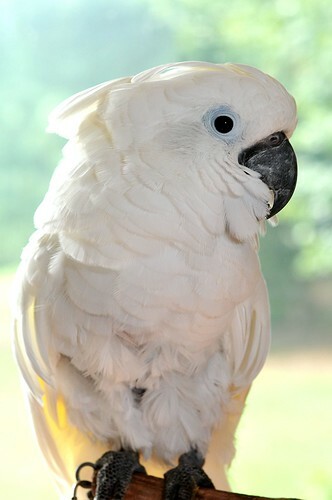 Cockatoos are easy birds to breed, while Amazons are not. Breeders discovered that Amazons require a very particular hole of a certain height and depth to breed. 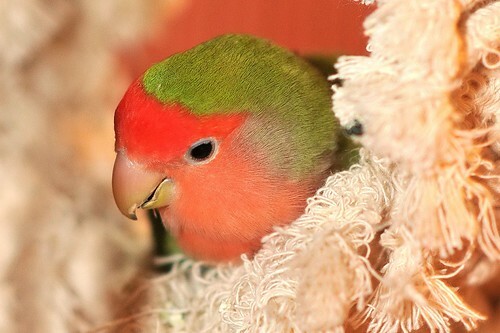 Some behaviors are inherited, like lovebirds stashing things under their wings. Most parrots are NOT designed to consistently reproduce. They are low-end reproducers. But, without environmental constraints, parrots can be in a continuous breeding mode. As hens produce more chicks, the hen’s health suffers, as does the health of the later chicks in the clutch. Later-born chicks are much less viable. 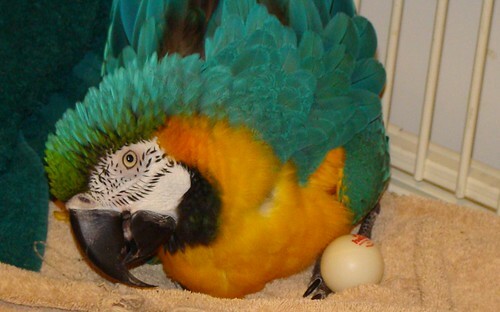 For example, 12 eggs in a year in captivity might be the bird’s lifetime norm in the wild. Parrots have evolved over 30+ million years. There are 332 species of parrots, with three subfamilies (Psittacine, Cacatuinae, and Loriinae). Two-thirds of parrots are neotropical Psittacines (189 species) – those who live in central South America and the Caribbean islands. The other third of parrots are found in Africa, India and South Asia (34 species) and Australia, Indonesia, and South Asia (109 species). Parrots are flexible in our homes because they are flexible in their natural environments of forest, swamp, and dry land. For example, mitred conures are found all over the US, and the Maui conure, which started as 2 birds, has now grown to a flock of 100. This myth assumes that one size fits all response to questions of proper diet, housing, behavior and other issues. However, each species and each individual will require care specific to their needs. There are three kinds of behaviors: innate, learned, and reproductive. Parrot’s innate behaviors are for flight, nest selection, and vocalization. Parrots learn other behaviors, from interacting with the flock. For example, taking off is instinctive, landing and navigating is learned. 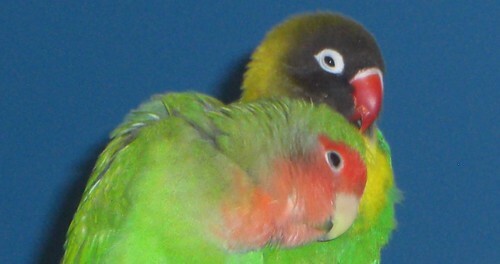 Some colony nesters, like conures, may want to be more connected to you. Reproductive behaviors include: pair bonding; vocalizations/duets; mutual preening; cavity seeking; nest building; sexual regurgitation; territorial defense; and copulation. The hypothalamus starts the process by sending message to the “master gland” the pituitary gland. The pituitary, in turn, produces hormones to send to target organs, the gonads. The gonads are inactive at times, small and seasonally involuted. Females have one ovary on the left side, to lighten the load for flight. The pineal gland is a day/night clock, sensing light which drives base physiology. Light is taken in through the eyes, the pineal gland and a third apparatus in the brain that is still unknown. This mystery apparatus has been proven to exist because birds who are blind and have no pineal gland still respond to light. The Limbic system is the part of the brain that runs bonding, emotional responses, and attachment forming. The species-specific hormonal cascade, from hypothalamus to pineal gland to gonad, happens in all birds. Testosterone is highest in a male during nest building according to a UC Davis study. Environmental triggers for endocrine events include light, molting, migration, and perhaps lunar cycles. Breeding and molting are biologically expensive and diametrically opposed. They do not happen at the same time. Due to these factors, umbrella cockatoos do best with a very ordered, predictable day/night cycle. Seasonal migration – great green macaws (also called Buffon’s macaws) migrate, as do Patagonian conures and smaller conures. These birds all migrate up and down in elevation. Tiny grass parakeets migrate 120 miles across the water to Tasmania to breed. 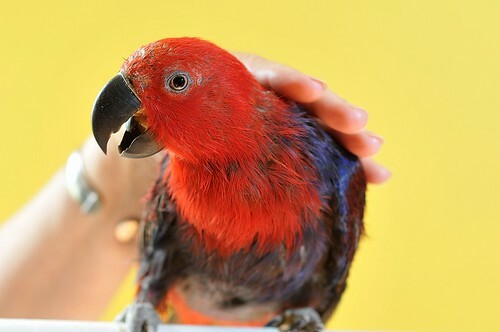 A hormonal trigger (as opposed to a metabolic one) produced by the thyroid takes parrots from breeding to molting. Primary feathers molt at a different time than those feathers on the bird’s trunk. Amazons and macaw share the same nest hole at different times throughout the year. Birds love warm food because of a thermal sensory apparatus on the roof of their mouth. When we give parrots warm food, we are simulating the actions of their mate. Vocalizations and other hormonal triggers such as pair bonding, abundant light and food, or nesting can lead to CHRONIC HORMONAL STRESS. Cavity seeking is also a result of the hormonal cascade. The bird may get on the floor underneath furniture, or go into a closet. When a parrot is well fed, has nest material, and has a lengthened photo period, the hormonal cascade can begin. Copulation is initiated by lower back scratching. Determinate layers have a specific number of eggs in a clutch. Budgies and cockatiels are non-determinate layers, laying eggs as long as the environment supports it. This causes a serious health risk to them. Birds who have been bred are naturally passing on the genes of productive breeding. In other words, the birds that survive the breeding process are going to be more inclined to reproduce. Parrots in the wild are low-end producers, and certain environmental constraints will limit their urge to breed. Food availability is not a limiting factor for neotropical birds (food is pretty consistently available around the equator). Neotropical birds are limited by the availability of nest sites. 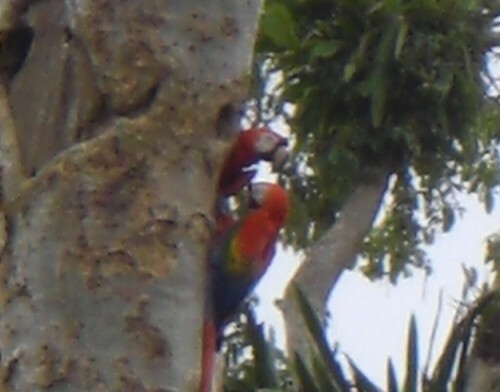 Charles Munn did a study on scarlet macaws and found that adding more nest boxes to the birds’s environment resulted in more chicks. However, the availability of food for those birds native to Australia, Africa and Indonesia can trigger or constrain their desire to breed. Seasonal abundance and drought is a limiting factor to non-neotropical birds. For example, goffins cockatoos in Australia struggle to find food and water during the drought. When food comes during the rainy season, they are ready to breed. They are designed for this kind of seasonal stress. Birds that are in a chronic state of hormonal stress can exhibit several different results. Degenerative conditions such as: osteoporosis; fractures; calcium and vitamin D3 deficiencies. Estrogen stimulates the blood vessels. In the wild, a bird regulates its temperature thru flight. However, thermal regulation problems in the wing webs and legs can be a problem for any bird in our homes. These areas (wing webs and legs) help the bird to heat and cool because they are highly vascular (contain a lot of blood vessels). The inside of the legs has large vessels. An increase in estrogen causes these areas to flush with blood. Without the proper ability to thermal regulate, a bird may become hot and flushed in these areas, which can also lead to feather picking. African Psittacines often develop feather destructive behavior at 9-14 months because they are over-stroked. They do not learn to fledge and fly as they would in the wild where their parents would make them leave the nest. Just because we think a bird loves something, doesn’t mean we should provide it. We should only provide things that are in the bird’s best interest, not ours. Examples are over-stimulation through petting and stroking, foods that contain phyto-estrogens (sweet potatoes, soybeans). Try “resetting” the bird by putting her in a novel environment. Part of the problem is that vigorous, healthy parrots who are not driven by the need to breed are more difficult to live with; they are more demanding to keep them occupied. They are full of healthy energy! When the vet does a physical exam, it starts with a detailed history. Hormonal problems can lead to plucking, which can lead to dermatitis. The feathers are designed to, among other things, protect the skin. Skin is not designed to be exposed. If your bird has this condition, be sure that the bird thoroughly dries after any bathing. It is especially important that the wing webs are dry. Therapies depend on each species, since they have evolved from different parts of the world (wet/dry; amount of light, etc). – Spending time outdoors, especially in flight aviaries when possible. Lupron can be given as a temporary solution. It down-regulates the gonads, but Lupron is expensive and it doesn’t work that long. Lupron sits on the binding site on the gonads, and prevents the hormones from landing and proteins from binding. It is a remedy, not a cure. HCG injections are anti-inflammatory. Helps itchy macaws. It is also not a long-term cure because the immune system recognizes it and it stops working. A more promising cure, Deslorelin, comes from Australia. It is an implant that lasts 8 months and is successful in hormonal birds. Essential Fatty Acids (EFAs): Can be given in the form of palm oil (Sunshine Factor recommended), for birds that eat palm oil (like African Greys); and flax oil for birds who do not eat palm oil. Another good supplement for all birds is Avian Vegi-Dophilus, a probiotic specifically for birds. Pellets are not recommended for birds from arid environments such as parakeets, lovebirds, and cockatiels. Pellets are hard on their kidneys and can cause gout. Avi-cakes are a good option for these birds. 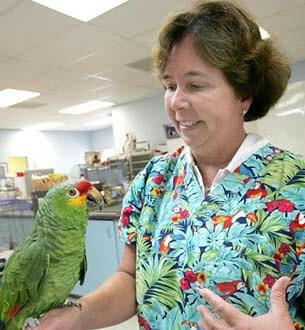 This entry was posted in Classes and Events, Parrot Education, Parrot Health & Safety, Phoenix Landing News. Bookmark the permalink. Amazing, amazing, amazing post!! Thank you!! I found the water/hormones connection particularly insightful. One question: when you say pellets aren’t recommended for “parakeets,” do you mean budgies, or all types of parakeets (like Indian Ringnecks, etc.)? This is the best article I’ve read about parrots and hormones! I learned some new things – thank you! I have a question about the last paragraph pertaining to pellets and birds from arid environments. Does the author mean Budgies when she refers to parakeets, or is she referring to indonesian species like Alexandrine Parakeets, or all of the above? What does she think about pellets and Pacific Parrotlets? They too are from arid environments, and I’ve often questioned the diet we feed them in captivity, as their wild diet is not well documented. Thank you! Any chance at getting Dr Van Zant back again next year for those who missed her talk? You mentioned “HCG injections are anti-inflammatory. Helps itchy macaws” what exactly is HCG? The part about flight and thermo regulation especially struck a cord with me, I’m going to work on flight training with my plucking 3 yrs adopted Green Wing now! Thanks again for the great notes Jenny! Hey guys, Here are the answers. HCG = Human chorionic gonadotropin, which is administered under the name of Pregnyl, Organon is another therapy that avian vets may use to stop excessive egg laying. Pellets and parakeets – Dr. Van Sant was referring specifically to budgies, not other parakeets. Regarding the question about parrotlets, let me get back to you on that one. I have heard from others that parrotlets do not do well on pellets, but do not know enough to answer. Dr. Van Sant was indeed very informative, and I took more notes at her lecture than in any I’ve attended in a long time. A good source of probiotics for birds recommended by Dr. Van Sant is made by Natren (http://store.natren.com/). Wow! I agree – that is the best and most comprehensive article I’ve ever read about parrots and hormones. Nice job. I’ve found yet another trigger for increased production of reproductive hormones also – the presence of other “hormonal” parrots. Observing all of Chris Shank’s birds has been very interesting, as well as those owned by another friend. It’s almost as if “nesty behavior” is contagious. I think I’d have to say that hormonal behavior is one of the most prevalent problems I deal with in my consulting. Thanks for such a wonderful and thorough overview of the problem. Fantastic, science based article. I train parrots and I couldn’t be in more agreement with your assessments. However, as to the pellets issue, there’s a compromise. I feed Roudybush Low Fat Maintence. It’s also low in protein. Helps with those hormones. It usually does the trick for my own hypersexual lovebirds when other measures (as described in your article) don’t suffice. I can’t deprive them of food or water just because that’s what the dry season does. Restrict, yes. Deprive? No. Diet low in fat and proteins, yes. Undomesticated species are hard enough to accommodate in captivity with their instinctual limbic urges. The backyard bird breeding of those who are most willing to mate, and for color mutations has got to stop! If people feel the need to breed, health and temperament for captivity NEEDS to be priority!